“I make New Mexico glass by melting metallic silver onto the molten surface of a dark glass. 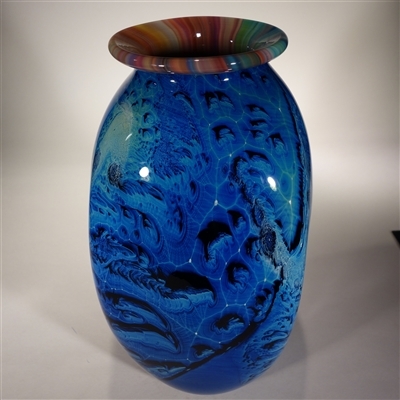 As I form each piece, I carefully control the temperature and flow of oxygen and propane into the glass furnace, to enhance and enrich the color. Recently I have been exploring making vases with full-inverted lips, which really shows off the Corona glass interiors." 7.5" H x 7.25" x 3"
11.5" H x 4.75" Diam.